September is the start of the new year. At least it is to me, and it has been this way for the better part of my life. My first day of school, in 1977, began the pattern that would map out all of the real beginnings in my life. I have marked back to school as the new year for thirty-four years; I have made this start with my friends, and I have also braved being the new kid who just moved to town. I have started as a freshman, a senior, an undergraduate and a graduate student; as the supply teacher, the new teacher, and the department head. 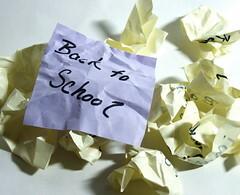 But my sense of the new year has almost always been marked by summer’s ending and school’s beginning. As this Labour Day weekend crawls to a close, I watch as summers’ blossoms struggle to stay open. The pot on my front step looks withered and tired from the heat, likely impatient also from my capricious watering schedule. Hopeful tomato plants droop sadly and struggle to free themselves from the poles I diligently tied them to in late spring, only a few green cherry tomatoes dangling from blighted roots. Fragrant herbs have gone to seed and flowered. Summer’s laziness, heat and spontaneity are sharply contrasted by eager bells, crisp mornings and the routines of school. Going back to school has so many fresh starts. This occasion even marshals a new style of dress to proclaim its commencement. Chipped summer pedicures and soles made rough from walking barefoot on beaches are covered in argyle socks, warm tights and new leather boots. T-shirts that reluctantly covered sunburned and freckled shoulders in warm evenings by the campfire are not enough to withstand brisk, dewy fall mornings that beseech for fleece to envelop shocked bodies risen early from morning slumber. Pastel hues make way for the deep, rich, jewelled colours of fall. Amethyst, emerald, amber. Textures of summer, cotton, silk– are exchanged for corduroy and wool. New provisions fill bags ready to carry the weight of change; pens brimming with ink, sharp pencils, unsullied notebooks, pristine text books and fresh packs of post-its. September pronounces itself as a beginning, while January merely whispers reminders of covenants made months before. Fall itself summons a fresh start. Verdant leaves transform in color and fall harvests burden tables with bounty. A far more dramatic swagger than January’s endless snow cover and naked trees; frozen fruit and vegetables thawed for dinner. As August wanes and my calendar page flips, I crave the change that going back to school brings. I am reborn over summer, refueled with energy and excited to start again. I enter this school year in a new decade of my own life ready and inspired to share what I have learned about myself- as a person, a writer and a teacher. A countdown will be marked (though I’ll be in bed long before midnight) as I ready myself for yet another back to school. Resolutions will be made, as they always are– but silently whispered and held in secret. Happy new year!